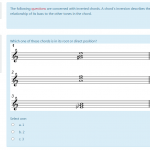 Quizzes are an easy way to carry out formative or summative assessment. One of the many great things about quizzes and objective tests in general is that you don’t need to mark the scripts – once you’ve written the questions you can re-use them as often as you like and Moodle will do the hard work of grading the students. 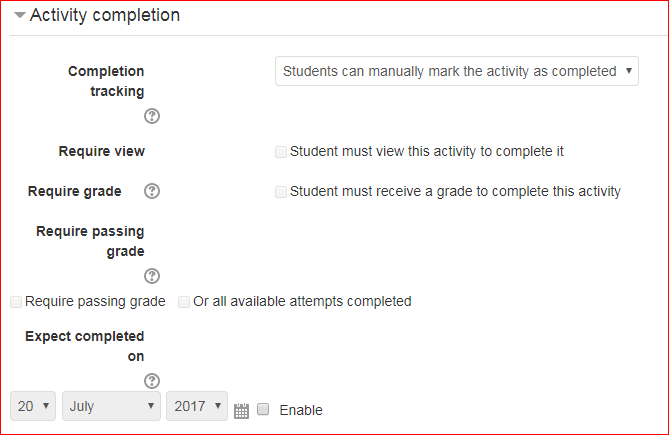 Each Moodle course has a default Question Category or Bank. 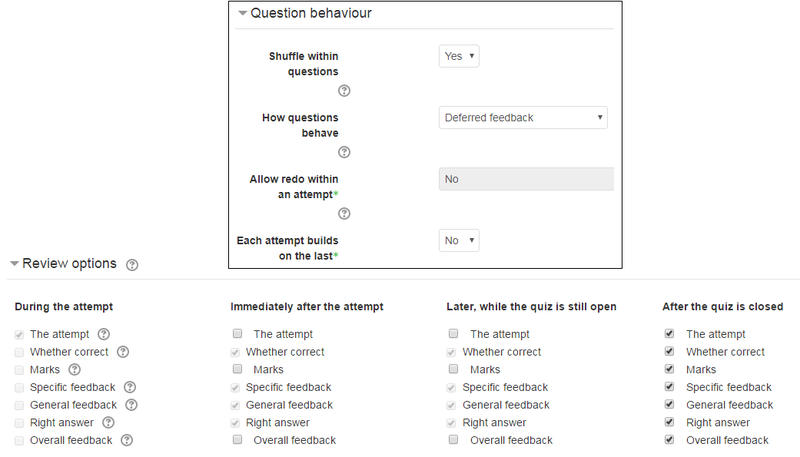 As quizzes are added to Moodle a discrete sub-category related to the quiz is created to hold quiz specific questions. 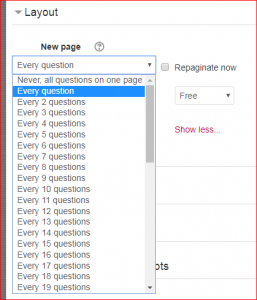 As the number of questions increases you are able to reorganise questions into different categories and pick and choose which should be used in new quizzes. The quick way to get a quiz going is to Add activity or resource>Quiz and follow the on-screen instructions, a quick overview of the settings is below. There are 17 question types available from ‘drag and drop’ to calculations, and these are all detailed in the official Moodle site. Probably the most common is the Multiple Choice Question (MCQ) and it’s variants True/False, Matching and Multiple Response. A useful option is a Description question which simply shows some text (and possibly images) without requiring an answer. It is more of a label than a question type and can be used to provide some information to be used by a subsequent group of questions. We can place time and date restrictions on the quiz e.g student has 30 minutes to answer 20 questions. Use the checkbox to enable Open, Close and Time limit settings and adjust as required. 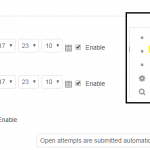 User and Group overrides allows you to use the same quiz but allow individuals or groups different time and date settings. 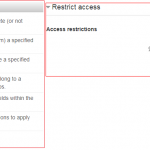 Note that overrides need can only be created once the quiz has been saved. You will notice that ‘when time expires’ has a default setting to submit open attempts automatically: if a student runs out of time, the last answers they have provided in the quiz will be submitted. It is recommend leaving this setting alone unless your instructions to students are very clear. 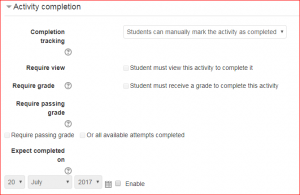 Grade to pass opens up the use of Activity Completion and conditional access to resources as described in the page on Tracking Progress. In the grade book pass/failing grades will be in different colours so easier to spot. Layout deals with how many questions are presented to students per page and how they can naviagte between questions. The default settings are one question per page which works well for longer questions but if you intend to use many questions you may want to change this to say ten questions per page. The Navigation method allows students to either move freely between question pages or be restricted to answering the questions in exactly the same order as you decide. Shuffling is just that! Questions options, eg. MCQs or matching questions, can be shuffled so they will appear in a different order to students sat next to each other. 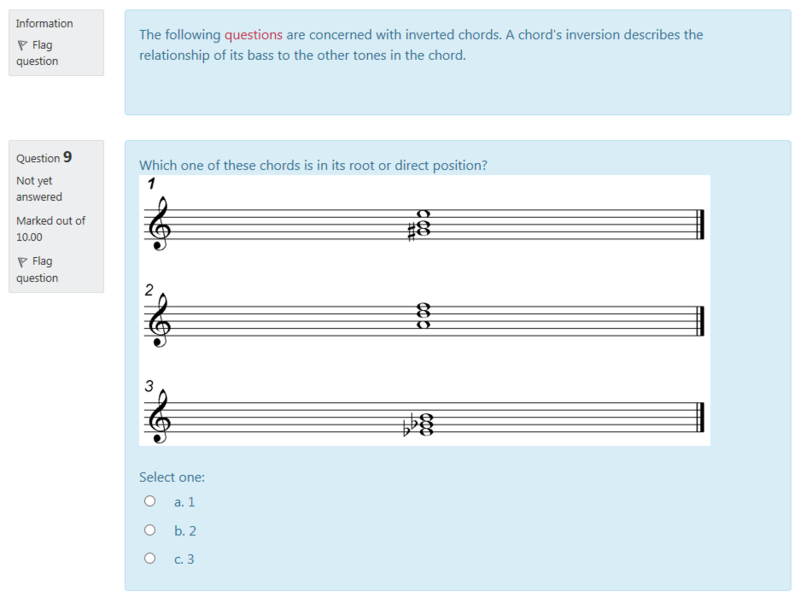 Note this is not the same as randomised question sets which are covered in this Quiz Guide – Random Questions. 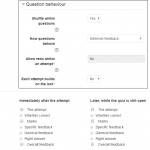 How questions behave adds control to when students receive feedback and these options are described on the official Moodle web site. Deferred feedback means that students will only receive feedback once quiz has been submitted which is the most likely setting. 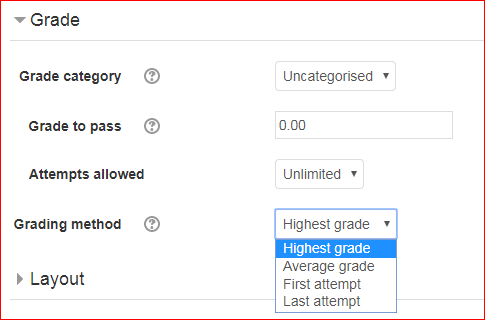 When used together with the Review Options (see page on Releasing Grades) tutors can have very fine control over what & when feedback students receive. Here you can define who can access the quiz or combine with Activity Completion conditions – the timings set earlier will still be active but these settings can add further restrictions. For example if you only wanted PT students to take this quiz, after splitting into the correct groups you would then choose Group to select the PT group from a drop down menu – so only those group members can access. If you don’t want anybody else to know there is a quiz for the PT group you would hide the activity from view using the ‘Eye’ button. If you are using Completion tracking you need to plan which activities are connected and which conditions need to be met. A pass grade can be set, but here we would use that pass grade to signal whether the Activity Completion condition has been met. If so then the Activity report would be informed.